Wash Bucket & Rinse Bucket With Colour Coded Bucket Filters & Lids. The Two Bucket Method has long been regarded as the best way to help keep your paintwork scratch free. These large, 20 litre Ultimate Finish Buckets are white - so you can keep an eye on the colour of the water - and made from a tough, durable plastic. The red 'Wash' label and the blue 'Rinse' label on the front will help remind you which bucket is which so you can keep your rinse water cleaner, longer. 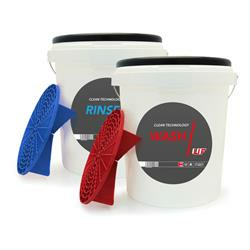 The Ultimate Finish Wash Bucket and Rinse Bucket each come with a Grit Guard™, colour-coded to correspond to the 'wash' or 'rinse' labels. The Grit Guard™ is a bucket filter system which sits in the bottom of the bucket and acts as a barrier, trapping dirt particles at the bottom of the bucket and preventing them from being reintroduced to the wash mitt or sponge. Simply brush your mitt or sponge across the guard to release any particles before continuing the wash. The lids help keep the buckets clean whilst not in use, or prevents leaves and dirt being blown into your wash and rinse waters on windy days! It also provides a handy seat for when you're concentrating on wheels and crevices. The best buckets that I have ever purchased! I was very reluctant to spend this amount on buckets due to the fact that you can purchase buckets from any other retailer for a fraction of the price. I can now see why these are priced at the price that they are. They’re a very deep bucket and are perfect for car washing. They’re clearly labelled wash and rinse so you can follow the two bucket method and not get your buckets mixed up. It also acts as a reminder that these buckets are used for your car cleaning and it should prevent you from using them to do other DIY jobs. The carry handles are fixed into the handles of the bucket. They come in white which is very handy because you can see when the water is filthy and needs changing. The handles of the bucket are very durable and it will not break easily. The buckets stack within each other nicely and you can carry both buckets using the bottom bucket handle. That makes it easier for carrying up and down the stairs of flats. The grit guards are “universal” and you can adjust them to make them a snug fit into the bucket so they do not move around. The only issue I have found with these is that the legs sometimes detach. I resolved this by setting the guards to the correct size & then use plastic superglue on them to fix them at that size. The lids are VERY solid and you can use them for sitting on whilst they’re not on the bucket. When putting them onto the bucket they “click” onto place & will not come off the bucket unless you really pull on them. They do not give a water proof seal but I have used them to transport water across the town to clean my motorcycle & they didn’t leak into my car. DO NOT lay the buckets on their side with water inside & the lids on. They will leak and they’re not a waterproof seal. I kept them upright during the transportation. I’m very glad that I purchased these buckets and I have recommended them to multiple friends. My verdict is that they’re perfect. Add them to your basket. You won’t be disappointed.